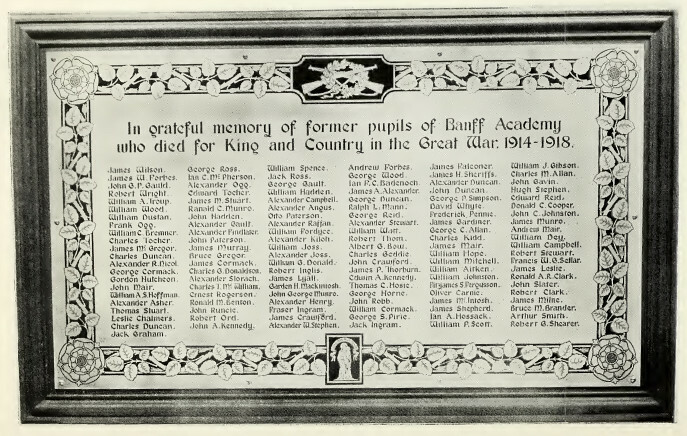 The following photograph is taken from the Roll of Honour published in the 1920s for Banff Academy. The memorial was erected in the Central Hall of the Academy by Ex-Bailie William Robertson, Interim Chairman of Banff School Board, and was unveiled on 9th September 1920. The memorial is still located in the school, as can be seen from the following page on the school website. It also contains information on some of the names, and details remembrance events carried out by the school.